While everyone else is posting sweet stuff for Valentine's Day, I have something savory and aromatic for you. Go ahead! 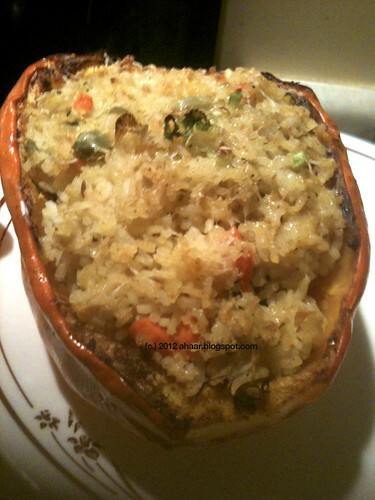 Woo your sweetheart with this delicious vegetable biryani stuffed squash. The recipe may take a little bit of prep time, but the result is so worth it. We first made this for our Thanksgiving dinner last year. Needless to say, everyone enjoyed it quite a bit. The presentation is beautiful, and the mild sweetness of the squash mixed with the heady aroma of the vegetable biryani makes for a perfect entree for any special occasion. Or turns any ordinary weekday into a special and relaxing evening. 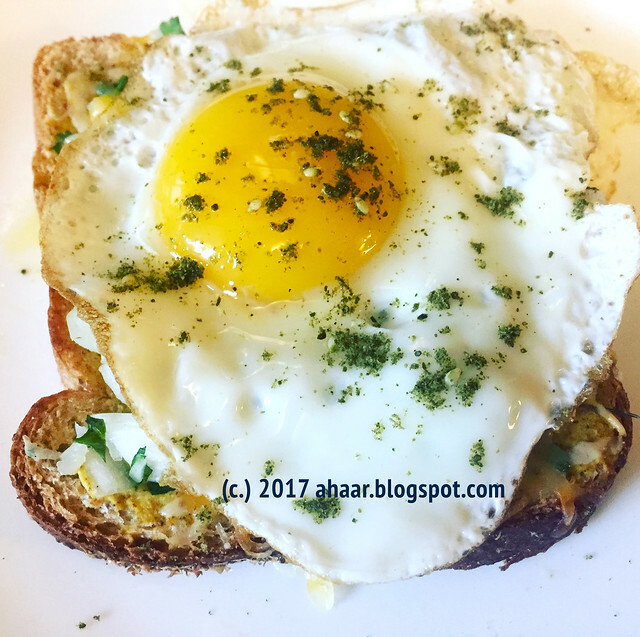 The original recipe is from chef Priyanka, we used her idea of the squash, but ended up following our friend's recipe for biryani. By the time we were done, the house was smelling delicious. Preheat the oven to 400 degF. Cut the acorns into halves and place them on a tray. 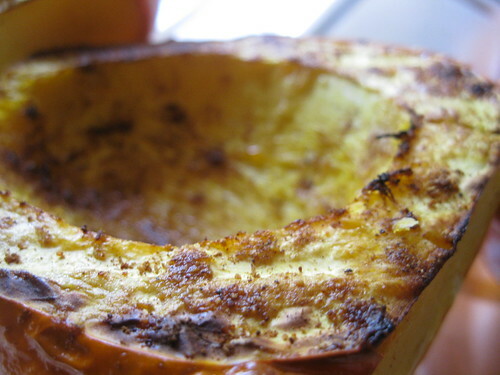 Spray them with oil, garam masala, cumin seed powder and salt. Let it cook for 9-10 minutes, and then turn the oven on broil and let it cook for another 4-5 minutes. Take it out and set it aside to cool. Soak the rice and then make the Biryani paste by grinding all the ingredients together. You can add a few splashes of water to make it into a fine paste. Add oil to a deep pan and then temper it with bay leaves, green and black cardamom, and cinnamon. Add the chopped onion and saute for a few minutes. Then add the rest of the vegetables - carrots, green pepper and peas. Saute it for another 2-3 minutes. Once the onions are translucent, drain and add the rice and mix it nicely. Let it cook together for 2-3 minutes. Now add half of the biryani paste and water and cook it on low medium heat for 10-11 minutes. In the meantime, take out the squash and make small cubes by scoring the squash. Don't cut through the skin, you need it for serving! Take out the cubes into a small bowl and set it aside. To the rice now add the rest of the biryani paste, saffron and mix it and let it cook for another 5-6 minutes. After the rice is done, add the squash cubes and gently fold it in. Use a fork to lightly mix the rice with the squash. 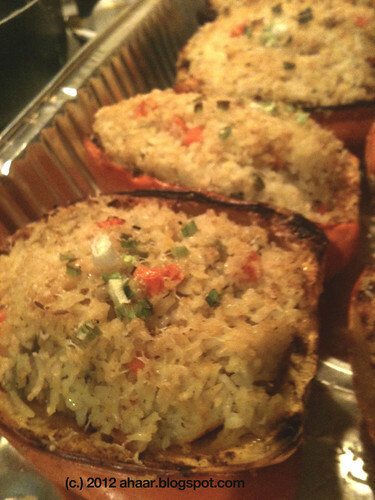 Now fill each squash shell with the biryani, add some grated parmesan and scallion pieces and put it in the oven on broil for 1-2 minutes. 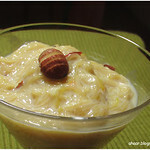 Serve warm with raita. 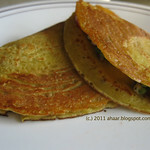 We served ours with raita, and a side of green beans. Evenings in our house is busy. Both the kids are demanding our attention, we are prepping for dinner and also catching up on our day. And if I get a chance, sipping on some tea as well. 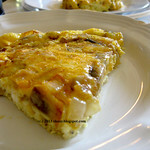 So most of the evening dinners are quick and easy to prep and easy to put together during the week. Lil A also eats what we are eating, so that means we are eating different kinds of pasta at least a couple of times a week. If I can throw in some lentils or vegetables in that mix, all the better. 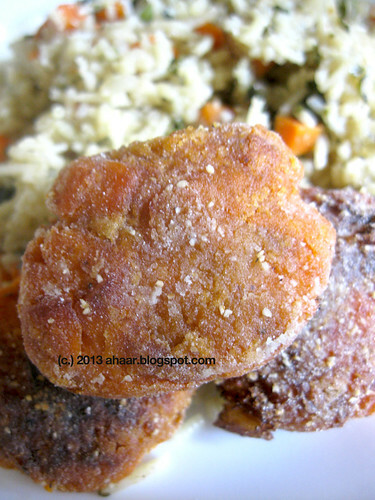 These sweet potato cutlets came out of that experimentation. Lil A likes his "alu bhaja" so I thought it will translate well to "orange alu bhaja" too. Not so. So I decided to take route #2 - cutlets. 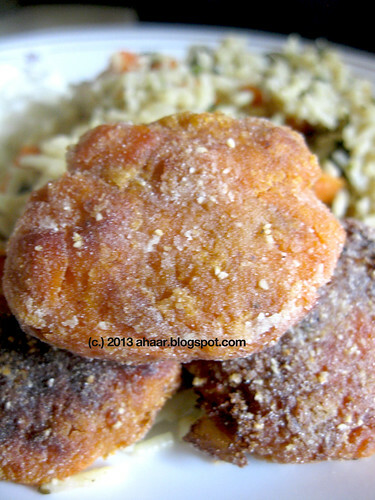 These sweet potato cutlets are the easiest thing and are sized just right for little kids. 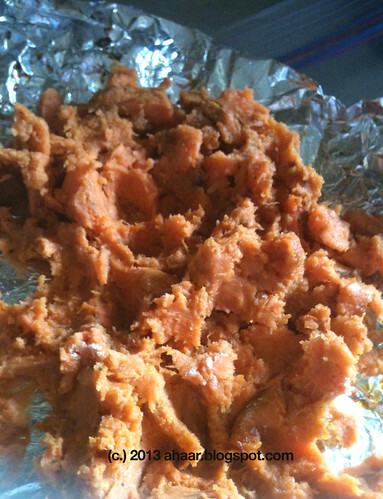 I let the sweet potato bake in the oven with the spices. Mix it all together and shallow fry them. The adults loved it, and Lil A tentatively finished one. I can live with that! How do you use sweet potato for your little ones? 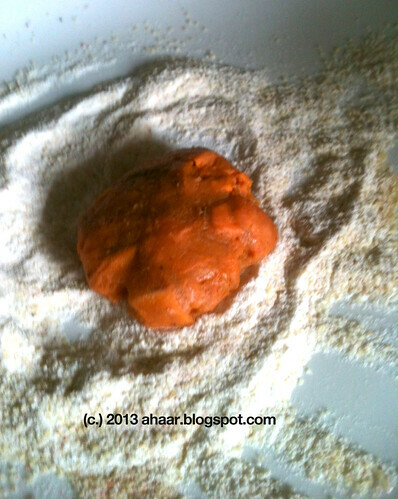 Here's another recipe I made with sweet potato for Lil A - sweet potato biscuits. Preheat the oven to 375deg. Peel and cube the sweet potatoes. Add about 2 tbspoon oil, salt, cumin seed powder, black pepper and salt and bake it for 40-45 min till the sweet potatoes are cooked. Mash it together. Now take little at a time and make round balls. Flatten each ball in your palm to make a cutlet. Toss it nicely in the rice flour. Heat a pan with some oil. 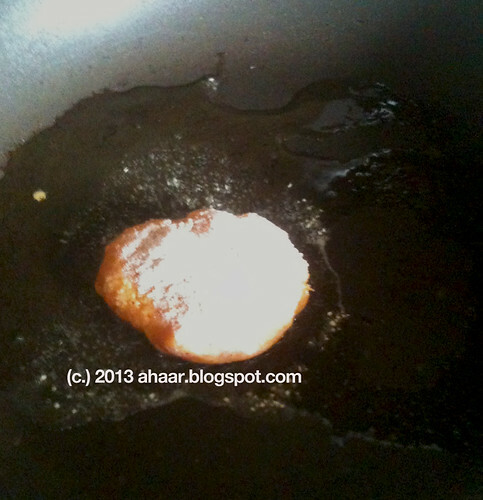 Shallow fry the cutlet till it's brown. Serve it as a side to almost anything. 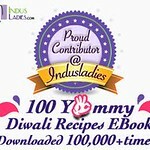 We had ours with vegetable pulao and raita.